There’s nothing better than having a beautiful modern kitchen. With all the choices out there on the different aesthetics and amenities, you can be as creative as you want to be. Your kitchen is a focal point in your home. It’s where everyone seems to congregate and gather during parties and family functions. 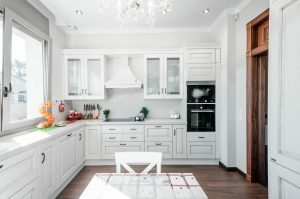 Whether you are looking to completely gut your kitchen and start from scratch or you are just doing an upgrade, there are a few important things you should consider before redesigning your dream kitchen and turning it into a reality. First and foremost, you have to know how much you are willing to spend. This could be the leading factor in determining whether or not you are doing a complete kitchen remodel from scratch or just a few upgrades. Take your time in researching all of the amenities and options that you want and price them out. If some of the options you are considering won’t fit within your budget, there are always less expensive alternatives that can give you the same look and feel you desire. For example, granite countertops can be quite expensive, so you may want to go with granite tiles instead. You can easily walk into any home improvement store and speak to someone on all the options for free. You should also take into consideration the cost of hiring a contractor. Interview a few kitchen remodeler contractors to find out which one will best suit your needs and budget. Kitchen cabinets are probably the most expensive piece of your kitchen re-design. Take your time to look through magazines and clip out different styles that serve as an example of your taste. There are many online resources as well where you can get ideas and find pictures. Pinterest is one of the most popular sites for kitchen re-design ideas. Nothing is conventional anymore. Consider re-purposed furniture as part of your kitchen design. The “shabby chic” look is still very much in style. Whatever your personal taste is, doing research before diving in can help save you from regretting certain choices and also save you money. If you’re happy with your current cabinets and would rather just paint them to be a different color that’s an option, you’ll just need to work with a company that’s experienced in wood stripping. Granite and quartz: Both are extremely sturdy. Although the most expensive, they are chip resistant, stain resistant and can withstand severe temperatures if you are placing hot pots and pans on top of them. Marble and Limestone: A little bit less expensive than granite and quartz with the same qualities, however, they are porous and can show stains and spills. If you choose to go with a granite or quartz countertop, choose a darker color to hide stains. Stainless steel: A very durable type of countertop, but can appear to look like a hospital examination room. Depending on the look you are going for, you should take the time to envision the aesthetic and how it will tie in with the rest of the kitchen. After a lot of use, it may appear dull and scratched. 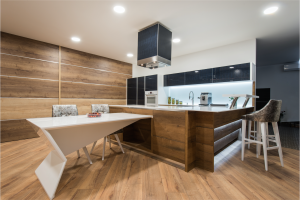 Wood: Wood can add a beautiful look to your kitchen as long as it is cured and sealed properly. With wood, you really need to be careful when cutting on the surface. It can get scratches if you aren’t careful to use a cutting board. Laminate – Laminate is by far the least expensive type of countertop, but it isn’t as durable as the above mentioned. If you know you aren’t going to be too hard on the surface; laminate is a great cost-effective alternative. There are even laminates that can emulate the look of granite, marble, and wood. How will you light up your room? Proper kitchen lighting sets the mood for entertaining. You should steer clear of fluorescent lighting in the kitchen. It can make the kitchen look cold and uninviting. 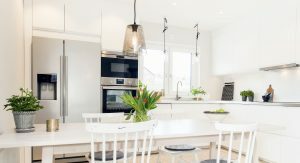 Take a visit to your local home improvement store and ask an expert in the kitchen remodel department on recommendations for the best fixtures and types of lighting for a kitchen. Look in magazines for ideas on shapes and fixture sizes. The proper lighting fixture and brightness of the light can make an impact on how you feel when in the room. Whether you are looking for a new refrigerator, sink or dishwasher, modern appliances that look great and function well is another key factor in a kitchen re-design. There are so many options these days, and there are more bells and whistles that come standard with appliances. Visit an appliance showroom or appliance store to get ideas on what color and look you are interested in. Take measurements of the spaces in which they are going to be placed so you know that the appliance will fit properly. If you are hiring a kitchen designer, they can help you make the right choices in both size and style that suits you best.